Building upon SOG's long tradition of working with and honoring Japanese knife makers, SOG partnered with kiku mats UD a, one of the Foremost tactical knife designers and blade grinders in Japan, to produce a line of knives. Together, matsuda's decades of experience in blade grinding and making fixed blade knives and SOG's production experience has created one of the most unique, striking, and functional blades available. Through this collaboration, mats UD a and SOG have won awards and continue to drive innovative and functional knife designs. This kiku fixed blade features matsuda's trademark and distinctive blade and handle grinds on a smaller 4-inch VG-10 steel blade and linen mic Art a handle. The full tang handle is uses elegant linen mic Art a slabs that are rugged, easy to clean, look better the more it is used, and offer superior grip in wet or dry conditions. It comes in a versatile kydex sheath with an adjustable low-profile, locking mount. 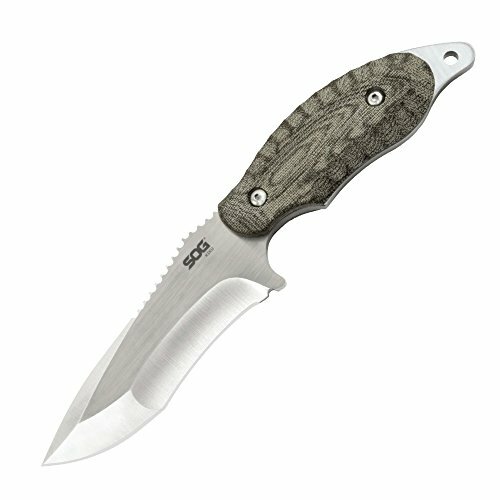 The kiku performs just like any workhorse knife, but it does so with more balance, class, and comfort.